I really need like 5 more hours in every day! How does this happen? I have been getting some stamping done - just can't seem to get them posted!! 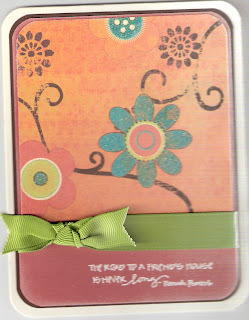 Here's a quick card I made for last week's challenge over at the A Muse Addict's Yahoo Group - come play with us! Stamp (one lonely stamp) by A Muse, CS by SU!, paper from that big stack from Costco (sorry, I can't remember the brand right now! ), ribbon by SU. You can't see it on my really bad scan, but I used a Versamarker and some IIEP to make the flowers in the paper sparkly - looks pretty good IRL. By the way - this 3/8" olive grosgrain from SU! is just about the most beautiful ribbon that I have played with in a long time! I need lots more! Home again, Thank the Lord!